As the worlds largest manufacturer of electric pallet trucks, EP offer a wide range of electric pallet trucks to fit the need of every customer and application. HOW TO BUY THE RIGHT ELECTRIC PALLET TRUCK? First of all you have to know the weight of the load it is that you’re transporting. EP offers electric pallet trucks which can move loads from 1000kg to 2000kg. Then you must ascertain the dimensions of the load that you will be transporting. EP pallet trucks can be delivered in a range of different fork length and widths to suit your needs. You will then also need to consider how you will use the machine. Is it mainly used indoor on flat surface? Or do you use the truck outdoor, over uneven ground, or for loading and unloading of HGV / lorries? Another important question to consider is about your charging habits and your requirements on the battery: If you want a light and low maintenance truck then the Li-Ion pallet trucks like the EPT 12EZ or the fully electric EPT 20-15ET truck would be a great choice. Those trucks can be charged as and when, require little maintenance, and do not need water refills or special charging rooms. Depending on the technology, the charging time varies between 2 hours (Li-Ion) and 8-10 hours (Gel Battery). Another choice is the traditional, lead acid battery. This battery is much heavier compared to Gel or Li-Ion, but is still the industry standard in many areas. The lead acid battery is less energy efficient and needs 8-10 hours charging. You also need to refill the batteries with water. As these batteries release gas during charging, it is necessary to ensure ventilation or special charging rooms and potentially special floor coating in charging areas. Warehouses can be treacherous places if proper precautions are not taken. Tight conditions are often an inevitable consequence of the functioning storeroom, which makes finding the right lifter a difficult task. But let us assure you that every single electric pallet pump we offer for sale is easy to manoeuvre around cramped environments. Visibility is also of the utmost importance in these situations, so every electric pallet jack available for sale is built with safety at the forefront, for your peace of mind. The same can be applied to construction sites and shop floors. Uneven terrain and immovable obstructions can often lead to logistical difficulties. That is why every EP electric pallet truck is versatile and comes in all manner of different sizes. 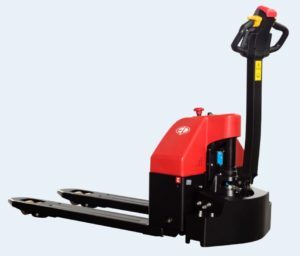 Whether intended for moving pallets to and from a heavy goods vehicle or simply ferrying material from one area of a site to another, we guarantee there will be a pallet truck for your application. If you have any questions with regards to buying the perfect pallet lifter for your work environment then please don’t hesitate to call us, and we can support you through the entire process.